The Hill of Crosses, where people not only from Lithuania have put crosses for couple centuries, witnesses faithfulness and trust of a Christian community to Christ and his Cross. This is an expression of a spontaneous religiousness of the people, and is a symbol not of grief and death but of Faith, Love and Sacrifice. From here the Pope blessed all people of Lithuania and all of Christian Europe. The Hill of Crosses is situated in the middle of an arable land, sixteen kilometers from Šiauliai. It is seen from Šiauliai – Ryga highway. The hill is 60 meters long and 40-50 meters wide. It is hard to imagine so many crosses in one place. But all these crosses tell us about personal and public misfortunes and catastrophes. For example one cross was put after the wreck of the ferry “Estonia”. The crosses were first counted by Ksywicki in 1900. In historical chronicles he wrote that there were 130 crosses on the hill. Two years later there were already 155 crosses. After the Word War I, in 1922 there were 50 crosses but in 1938 – already over 400. In 1961 the Soviet government demolished over 5000 crosses, by 1975 – 1200 crosses more. After the political change the crosses were counted by enthusiasts from Šiauliai. They found 14 387 big crosses (1 112 from them were 3-4 meters high, 130 even higher) and about 41 000 small crosses (smaller than 0.5 meters). Each visitor tries to leave a cross or a rosary. If he has not brought any, he makes one right on the hill, from pebbles, little branches or grass. In 1994 during his visit to a Franciscan monastery of the mount of Verna (Italy), the Pope John Paul II encouraged the brothers to build a monastery by the Hill of Crosses. A hermit of the Franciscan Brothers was consecrated on July 7, 2000. It is built 300 meters away from the Hill and has sixteen cells. It serves as a novitiate of the Lithuanian Franciscan province of St. Casimir, but the monastery is also open to the pilgrims who look for silence and peace. The crosses on the Hill were first mentioned in written chronicles in 1850, but it is believed that the first crosses were put by the relatives of the victims of the rebellion in 1831 as the tsarist government did not allow the families to honor their deads properly. Crosses of the kind became more numerous after the other rebellion in 1863. In the beginning of the 20th century the Hill of Crosses was already widely known as a sacral place. In addition to many pilgrims visiting, it was also a place for Masses and devotions. The Hill of Crosses became of special importance during Soviet times – this was the place of anonymous but surprising persistence to the regime. The Soviet government considered the crosses and the hill a hostile and harmful symbol. In 1961 wooden crosses were broken and burnt, metal ones used as scrap metal and stone and concrete crosses were broken and buried. The hill itself was many times destroyed with bulldozers. During the 1973–1975 period about half a thousand crosses used to be demolished each year without even trying to do this secretly. Later the tactics became more subtle: crosses were demolished as having no artistic value, different “epidemics” were announced forbidding people to come into the region or the roads were blocked by police. The Hill was guarded by both the Soviet army and KGB. In 1978 and 1979 there were some attempts to flood the territory. Despite all these endeavors to stop people from visiting the Hill, crosses would reappear after each night. After the political change in 1988 the status of the Hill of Crosses changed completely – it became both a Lithuanian and a world phenomenon. It gained a world wide fame after the visit of the Pope John Paul II on September 7, 1993. The Pope was extremely touched by the cross with the prayer for his health after the attempt upon his life in 1981. In his sermon during the Holy Mass his Eminence said: “Sons and daughters of your country have been carrying to this Hill crosses, akin to that of Golgotha, which saw our Saviour,s death. Thus people have declared their sincere belief that their deceased brothers and sisters “have found Eternity” (…). Cross is a symbol of eternal life in God”. In 1997 the Church revived devotions on the Hill. They take place every year on the last but one Sunday of July. 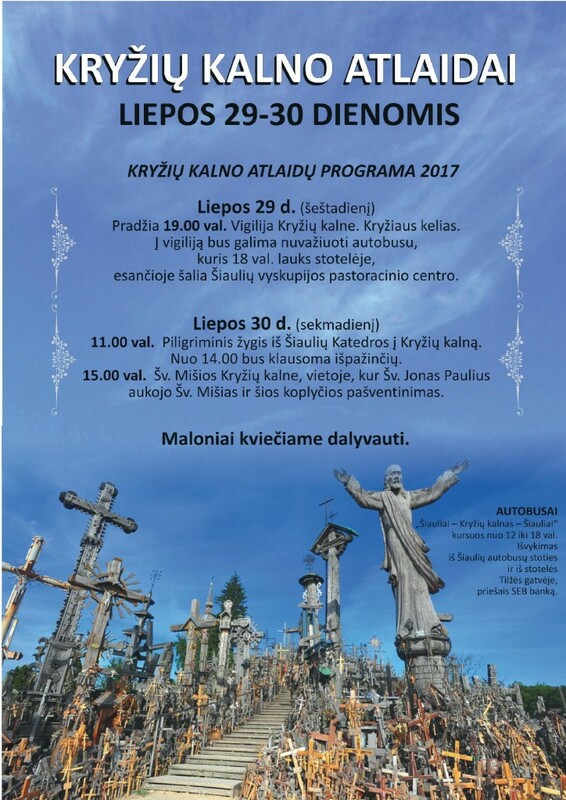 Nowadays the Hill of Crosses is under the patronage of Šiauliai diocese, established on the 28 th oh May, 1997, and its first bishop Eugenijus Bartulis. The Hill of Crosses is a sacred place in the Šiauliai region with especially vast spaces for meditations of faith and manifestations of one,s love to God. It is here that Lithuania has passed through Golgotha, its people have experienced so much pain and misfortunes. Namely here revives the sincerest belief in our Saviours sacrifice, love finds response in one,s heart, hopes become stronger. “For God so loved the world, that he gave his only Son, that whosoever believeth in him should not perish, but have eternal life” (Jn 3, 16). Cross is a symbol of such Love.